If you’re moving to Taichung, you’re probably looking online to find a detailed Taichung population density information. 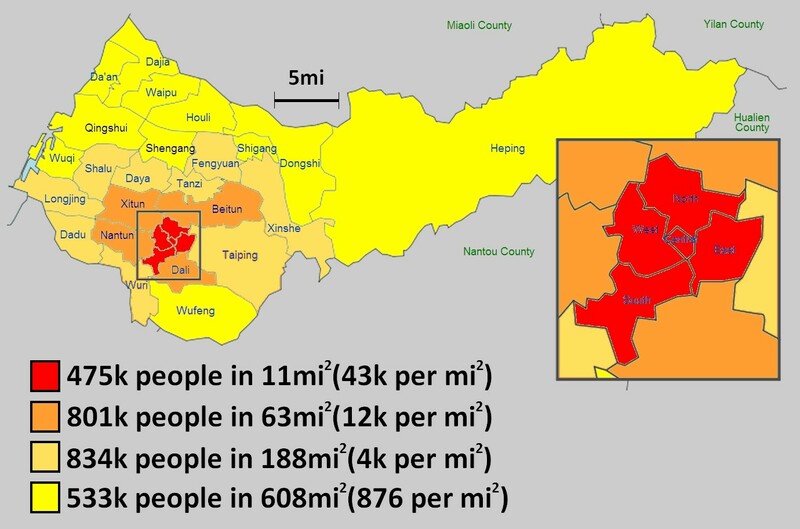 Officially, Taichung has 2.6 million people spread out over 1500mi2 translating into a population density of around 1800 per mi2, but that’s pretty misleading. 90% of the population lives in areas with a higher density than that. There aren’t many places in Taichung where the density is only 1800/mi2 – it’s that, in many places, the density is almost zero. 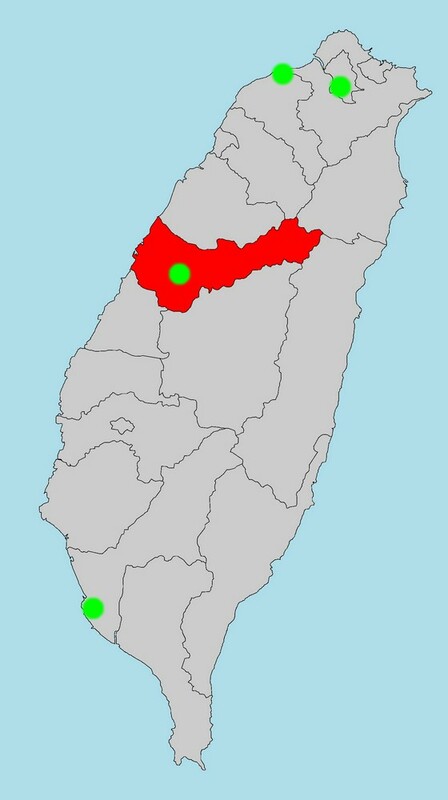 First things first: let’s take a look at a map of where Taichung is, relative to the rest of Taiwan. While Taichung was once a county and a city, it is now often referred to as “Big Taichung.” This is a serious issue, as there are 29 different districts within what is now Taichung. Some areas have a population density nearly as high as Manhattan while other districts can be as low as many rural areas in the USA. All this in an 850mi2 area: the size of an average American county. Here’s how it looks, topographically, with the county line crudely drawn in red by me. This gives you a basic idea of the topography and where the population is going to be. Grey = roads. Roads = people. Green = agriculture or mountain. Let’s take a closer look at Taichung on a map and see how it all breaks down by district. While the red areas are considered “Original City,” the area that would be considered “The Heart of the City” encompasses the West, North, and Central Districts, and has 290,000 people in a 5mi2 area. That’s 58000/mi2. Manhattan has 70000/mi2. Brooklyn has 35000/mi2. The South and East Districts are populated (14000/mi2 – like Boston or Chicago), but there’s not much there – the city really grew west, into Nantun and Xitun, more than towards the south or east. The Outskirts are the outskirts – there’s not as much there (in terms of convenient living) and the density is significantly lower – around what you’d see in Denver, Dallas, or Atlanta. Rural regions are legitimately rural, averaging only 825/mi2. There are areas in the city that are as dense as the densest parts of New York City and there are areas in rural farm country that are as low as one would expect in any agriculturally-driven area. The City of Taichung is only 40mi2 but it has over a million people. So, the city averages around 25000/mi2. The Bronx has 24000/mi2, with a slightly larger land area and a slightly larger population. Taichung can feel as dense as the densest big cities in the USA, if you live in the heart of it. Now that you understand the detailed Taichung population density, it should make it easier to understand life here. This entry was posted in Taiwan Writings and tagged airport, beitun, big taichung, boston, bronx, brroklyn, chicago, china, city, data, density, Detailed Taichung Population Density, district, districts, information, kaohsiung, los angeles, manhattan, mi2, nantun, new york, new york city, nyc, population, republic of china, roc, rural, san francisco, seattle, statistic, statistics, suburb, suburban, taichung, Taichung Population Density, taipei, taiwan, taoyuan, united states, urban, usa, xitun.